One of the easiest ways to make healthier choices is to stock the pantry with key ingredients for making healthy meals. From Jan. 15 – 17, 365 Everyday Value products are 10 percent off. Shop hundreds of value priced items from frozen meals, fresh produce to spices, baking essentials and even body care. 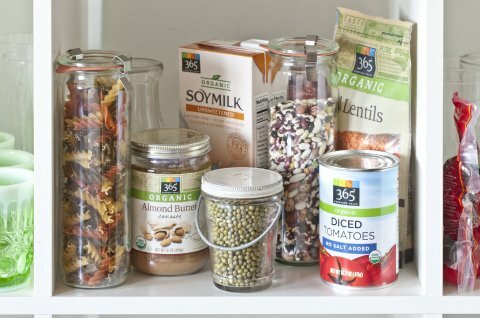 Why shop Whole Foods Market’s 365 Everyday Value items? These items meet the company’s strict quality standards – which means no artificial colorings, flavors or preservatives – and are available at a value price point. Keep basic staples on hand like coconut and olive oil, whole grains, dried beans and low sodium vegetable broth. Here’s a list of items to fill the pantry with. Swap conventional family-favorites like sandwich cookies, mac & cheese, cereals, yogurt and peanut butter with healthier versions. 365 Everyday Value versions of family-favorites are free of artificial colors, flavors and preservatives and dairy products come from rBST free cows. Once or twice a week, shop for more perishable items like lean protein and seasonal produce for a complete meal. A tip: Whole Foods Market offers promotional pricing on family packs and value packs in meat, seafood and produce. Look at labels. Whole Foods Market offers 365 Everyday Value organic offerings to provide shoppers with high quality organic products at everyday value prices. Look for the USDA certified seal and save. Look to the freezer for savings when produce is out of season— frozen fruits and veggies found at Whole Foods Market are picked at the peak of freshness and frozen. Shopping seasonally in the produce department is a great saving strategy. When many fruits and vegetables reach their peak harvest time, the costs often drop due to increased availability. This week, from Jan. 13–19, Organic Lady Alice apples are on sale for $1.99 per pound. Plan meals with healthy family-friendly recipe ideas in mind like this Veggie and Tofu Scramble,Chicken Taco Pizza or this creamy vegan broccoli cauliflower soup. Click here for more ideas.